Take a picture of your entire face. While keeping your natural smile, please show as many teeth as possible . The photo must show you directly facing the camera with head straight (not tilted). Please see photo to the right as an example. Save the photo on your phone/computer. Click on the “Browse” button below to upload your image. We will send you an email within 2 working days containing the results of your e-smile makeover, showing you what your teeth will look like after a smile makeover along with an idea of the treatment options that may be suitable for you. 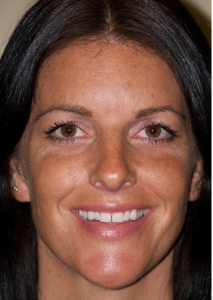 Tell us why you are unhappy with your smile and give us some ideas of what you would like to change. Please note that larger images may take a minute or two to load. Once the form has been processed, you will be redirected to a confirmation page.